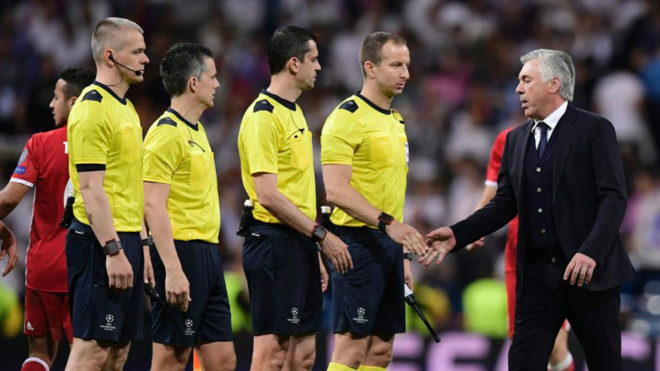 Real Madrid will take on Juventus in this season’s Champions League final, but Carlo Ancelotti is still upset that they made it past his Bayern Munich side in the quarter-finals given that the second leg was marred with controversy. The Italian coach believes there is a need to introduce video technology to avoid such refereeing errors. “It was an injustice,” he said of the Bundesliga champions’ European elimination in an interview with Corriere. “It will go down in history that Real Madrid eliminated Bayern Munich, but the world saw what happened in Madrid. Looking to the future, Ancelotti discussed the fact that two of his former teams are facing each other, but said he had no particular preference, even if he’d love to see Gianluigi Buffon win it for the first time. “I will watch the final with interest, supporting whoever plays better,” he said. “For me, Juventus is essentially Buffon, who was one of my players. Also discussed in the interview was the decision Zinedine Zidane has to make up front and Ancelotti explained the logic behind Alvaro Morata’s place on the bench. “That’s because [Karim]Benzema is the best player to play with [Cristiano] Ronaldo,” he pointed out, while also dismissing the notion that Los Blancos are too reliant on their No.7. “They also have [Luka] Modric, [Sergio] Ramos, Marcelo, Benzema and others. Finally, Ancelotti said he was not surprised by the success his former apprentice Zidane is enjoying, labelling him an intelligent coach.